Norton Creek Press, January, 2016. 194 pages. Suggested retail price: Paperback $19.95 (Kindle: $5.97). Simple-living advocate Ruth Stout, author of Gardening Without Work and How to Have a Green Thumb Without an Aching Back, believed that life just doesn’t have to be so hard! As a counselor, I’ve read plenty of self-help, recovery, and psychology books over the years, and I’m familiar with therapies and techniques that instruct people in how to be happier. If You Would Be Happy is different from any of the happiness manuals I’ve read though, because it’s so refreshingly frank and conversational. 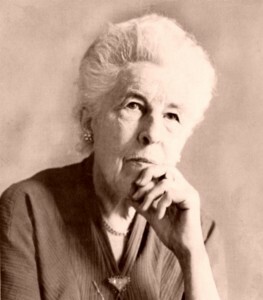 Ruth Stout is the eccentric relative that I wish I’d had, one with that refreshing mix of caring and candor. Rather than challenging errors in my thinking or analyzing my issues, she might serve tea, and point outside to a lovely flower in bloom. She would have modeled for me that there’s happiness to be found, right here, right now. No fuss, no formula. Ruth’s ideas are far from new. They are continually being rediscovered and repackaged, often in forms far more elaborate than Ruth’s deceptively simple wisdom. For example, DBT (dialectical behavior therapy) teaches mindfulness, as well as giving step by step guidance in important skills, like to keep the little things from building up into catastrophes. And it shows, step by step, how to make interactions smoother, how to relate to difficulties without inadvertently making them worse, and how to keep small things from building up into catastrophes. These are good skills. They are outlined in DBT handbooks and worksheets, hundreds of DBT groups meet every week to discuss these skills, and many people are helped. The best DBT therapy relies on the humor that the counselor brings to the process. If you’re looking for the kind of candor and wit that DBT therapists are encouraged to offer, this book is a great source. If You Would Be Happy is meant to help anybody with a desire to have a bit more—or a lot more—contentment. Ruth offers plenty of “case examples,” too—funny and touching ones about that neighbor down the road, or that eccentric acquaintance that stayed with her years ago. This book reminds us that we are in this happiness quest together. We could all use a little coaching now and then to take our troubles a bit less seriously and to tend to our own happiness, and the contentment of those around us. These ideas apply to grown-ups and children alike. They’re fun, they work. And they just make sense! Ruth Stout was a beloved advocate of organic gardening, and her book,Gardening Without Work, and her magazine articles popularized her style of simple living to millions. 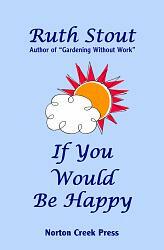 If You Would Be Happy was first published in 1962, and Norton Creek Press is proud to offer it to a new generation.